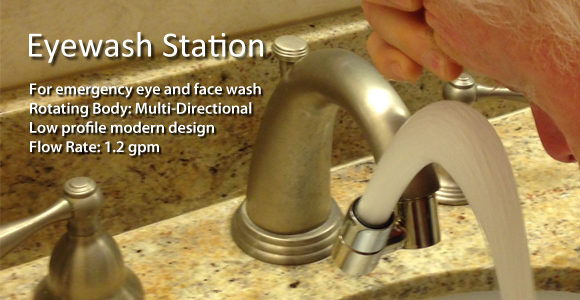 A low profile emergency eyewash station that adapts to a wide range of office and laboratory faucets. It provides instant access to a single aerated water jet, flushing the eyes and washing the face of any chemical or particulate contamination. 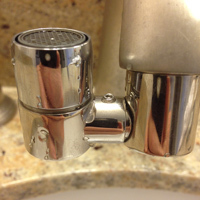 The unique design allows water to flow normally downward for washing hands, and during an emergency, the user can quickly rotate it upwards, providing a soft stream of water that will wash the face. The user places the water stream on the brow of the nose and both eyes will receive an effective rinse. If esthetics are of concern in a doctor's office, this eyewash has a modern design that does not interrupt the look and use of the office sink and provides the proper safety for all personnel. Low profile modern design. Polished stainless steel. 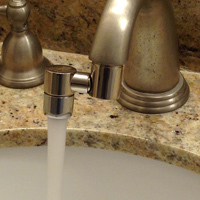 Fits most standard faucets. Design prevents internal standing water and stops mold from forming. 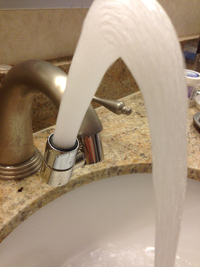 Flow Rate: 1.2 gal per minute exceeds ANSI standards.